Sterling silver for the table and sterling silver gifts for every occasion, hand made to the highest quality by Broadway of England, silversmiths for over 100 years. 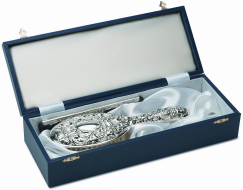 We specialize in sterling silver for the table, but we also have a variety of silver gifts for ladies, men, and christenings, all beautifully presented in silk lined boxes. All independently hallmarked and guaranteed 925 parts silver in 1000. 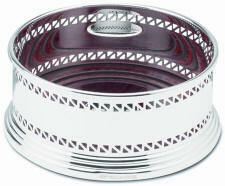 Over the last 100 years Broadway Silversmiths have built an envied reputation and unrivalled place in the affections of silver buyers for their unerring commitment to quality of design and manufacture. Preserving the very best of Victoriana for those who prefer traditional styling, with many of the current range still produced from the original 19th century dies made by the founder. The entire Broadway range of fine quality hallmarked Sterling Silver is still made by highly skilled craftsmen using the same expertise employed for over seven hundred years since the very beginning or ornate silverware in England. 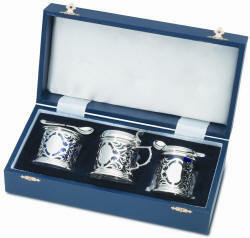 All the following are available on this site and are produced in sterling silver - napkin rings, condiment sets, rose and posy bowls, silverware coasters, silver candle holders, rattles, curl and tooth boxes, 4 piece sterling silver dressing room sets, silver goblets, sterling silver key rings and much, much more.